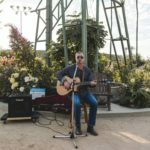 (Costa Mesa, Sept. 10, 2017) – Restaurants Care, a new program to support restaurant workers facing an unforeseen hardship, officially launched on Saturday night with The Grateful Table fundraising dinner. 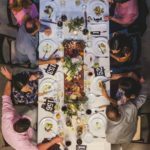 The multi-course dinner featuring nine celebrated chefs was held on Sept. 9 on the grounds of ​Centennial Farm at the OC Fair & Event Center. A twilight reception in the culinary garden kicked-off the festivities. 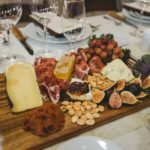 The family-style dinner, served under strings of market lights in the barn, included a curated charcuterie board, heirloom tomato and stone fruit salad, tri tip, salmon, and fingerling potatoes with chimichurri rosa. An assortment of French pastries, courtesy of Moulin, was served under the stars for dessert. Participating restaurants and chefs included: Ryan Adams of Three Seventy Common in Laguna Beach; Taylor Boudreaux, Waldo Leyva, and Mathew Robinson of Cypress-based Real Mex Restaurants, Penny Davidi of Los Angeles (a former Food Network Star contestant and a Sysco consultant); Jason Namaan of Craft House in Dana Point, Jeoffrey Offer of Moulin in Newport Beach/Laguna Beach and Ross Pangilinan of Mix Mix Kitchen Bar in Santa Ana. The dinner ended on an emotional note when Irene Correa, a Restaurants Care grant recipient, took to the stage to tell her story. 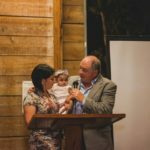 With her four-month-old niece on her hip, Irene opened up about her sister’s drug addiction, needing to adopt her niece and having only $1.50 in her bank account when she received the Restaurants Care grant. The grant covered two months of daycare and allowed Irene to continue to work as a restaurant manager. The Restaurants Care fund provides basic living expenses to help restaurant workers who face unforeseen hardships, illnesses or a natural disaster. Alycia Harshfield, executive director of the California Restaurant Association Foundation, said Restaurants Care wants to give “peace of mind” to workers who are the heart of the industry — from dishwashers to line cooks and bartenders. “I am moved and humbled by the generosity of our supporters. 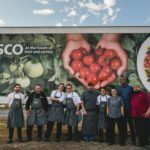 Sysco Los Angeles, in particular, stepped up in a big way. Together we raised $73,000. This will serve as a life-line for restaurant workers in their time of need. The CRA Foundation is honored to be a meaningful resource for restaurant workers,” commented Harshfield. 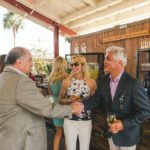 Event sponsors include: Sysco Los Angeles, the OC Fair & Event Center, BJ’s Restaurants, Wienerschnitzel, Real Mex Restaurants, California Pizza Kitchen, Rodney Strong Vineyards, Karl Strauss Brewing Company, Coca-Cola and Chilewich. Visit www.calrestfoundation.org/gratefultable to learn more.